Imagine that the market just formed a bullish two-bar reversal at a support area. Your assessment of the market is bullish. You decide to enter the market. You click on your trading platform to enter the market with a __________ . d. Is there a difference? There are many discussions of trading with price action patterns (bar and candlestick patterns) and support/resistance. But most gloss over the technical aspect of exactly how to enter the market. Most trading platforms offer three order types: stop order, market order, and limit order. Let’s start with the distinction between a market order and a limit order. A market order is executed immediately. But you do not know what price your order will be executed at. Its execution is guaranteed, but the price is not. A limit order must be entered with a limit price. You can only place a buy limit order below the market price. (Placing a limit order above the market price turns it into a market order.) Similarly, you can only place a sell limit order above the market price. If the market lets you in at the limit price, your limit order will be filled. If the market does not hit your limit price, your order will not be executed. The implication of a limit order is the opposite of a market order. While you know the price your order will be filled at (if it does), you have no assurance that it will be filled. Once you understand the difference between a market order and a limit order, you will find it easy to learn what is a stop order. A stop order is a conditional market order. A buy stop order is placed at a price level above the market price. (A sell stop order is placed below the market price.) When the market hits that price level, the stop order becomes a market order to be executed immediately. Note that a stop order becomes a market order when triggered. This means that the fill price is not guaranteed. Simply put, stop orders are for trading break-outs and limit orders are for fading them. If you think that price will continue in the same direction after a break-out, use stop orders. The chart above shows a snapshot of a bearish market. Bearish inside bar. We expected the market to fall further after breaking below the inside bar. Sell stop order triggered as the market breaks down below the inside bar. 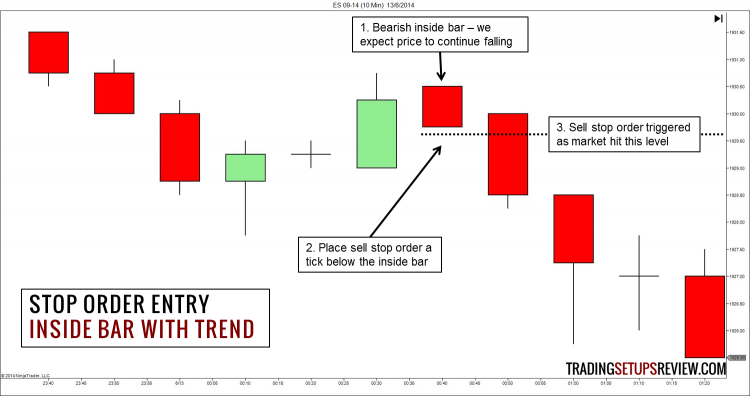 In this case, we are using a sell stop order to trade the break-out of an inside bar. We can also use stop orders for trading the break-out of any other price action formations. They include price patterns, swing pivots or any other support/resistance levels. Stop orders offer the advantages of confirmation and efficient execution. Stop orders are only triggered on break-outs. The break-out serves to confirm our market assessment. Hence, with stop orders, we are entering the market with confirmation. If the confirmation (break-out) does not occur, we will not enter the trade. Moreover, it is the most efficient way to trade break-outs. If we waited for the break-out before entering a market order manually, we might suffer great slippage. However, with a stop order, the break-out automatically turns the stop order into a market order to be executed right away. Although we might still suffer slippage, using stop orders still beats manual entry of market orders. When I trade price patterns, I prefer to use stop orders. This is because price patterns are break-out signals. Price patterns are hints that price would break-out and continue in a direction. Bullish patterns point up and bearish patterns point down. If you think that price will reverse its direction after a break-out, use limit orders. There are two typical scenarios. You might want to fade break-outs of a price range. Or, you might want to fade a counter-trend move. The example below shows the first scenario. This trading session has moved nowhere since it began, forming a tight trading range. As we expected break-outs of this tight trading range to fail, we placed a sell limit order just above the session high. As price surged up, our limit order was triggered. Having our order filled just above the trading range, we had plenty of profit potential. 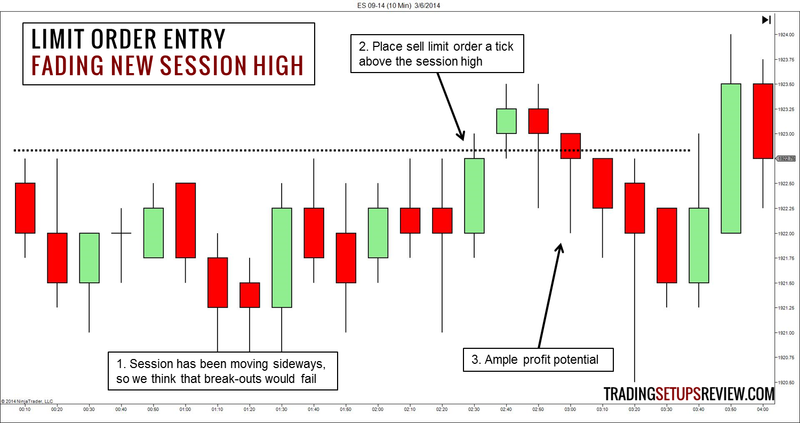 When trading a tight trading range, limit orders are ideal. If not, your profit potential might be severely handicapped. Entering the market with limit orders is an advanced technique. This is because, at its core, limit orders represent a bet against the most recent market movement. At a micro level, using limit orders is reversal trading. And reversal trading is always tricky. But if you are able to use limit orders wisely, they offer a great timing advantage with little adverse movement. With a well-placed limit order, you need not suffer more than a couple of ticks of paper loss throughout your trade. The general rule is use stop orders for break-outs and limit orders for break-out failures. But the overriding principle is to use what is consistent with your trading strategy. If your trading strategy dictates a certain entry method, follow it unless there are reasons to tweak. Entry methods, like any other parts of a trading strategy, can never be perfect. Do not seek the perfect entry method. Simply understand their implications and trade-offs. 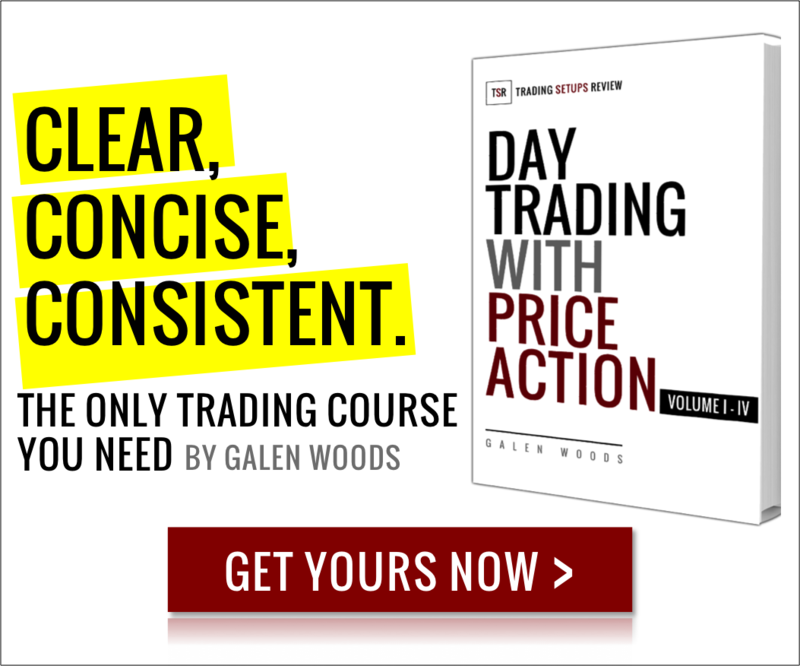 For an in-depth guide to price action trading, check out my course – “Day Trading with Price Action”.